Important: For Lync 2013, after applying the March 10, 2015 update for Lync 2013, users will only be able to view who modified the Text Annotation on the Whiteboard. This is different from the behavior in Lync 2010. The user can click on the text annotation and a box will be displayed that identifies who created and modified that text annotation. Other types of annotations do not display who created or modified the object on the Whiteboard. Office 365 (Lync) users, click here. Lync Basic 2013 users, click here (even if you’re using Office 365). All other Lync 2013 users, click here. 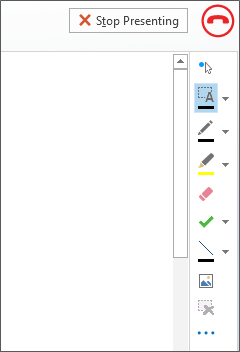 Pause on the present (monitor) icon, and then click Whiteboard under the Present tab. The Whiteboard closes automatically if you switch to another presenting option, but will be available in the Presentable Content window if you want to open it later in the meeting. Just pause on the presentation (monitor) icon, and click Manage Presentable Content to access the Whiteboard again. Laser Pointer: a virtual laser pointer. Click and drag the pointer across the page. A blue circle appears in the meeting indicating your name. Select and Type: selects an area to type. You can change font, size, and color by clicking the arrow next to the Select and Type to open the menu. Pen: draws freehand. Click and start writing or drawing in black, or click the down arrow next to the button, and then select another color. Eraser: removes specific annotation you choose. Stamp: inserts a stamp on the page: Arrow, Check, or X. Choose an option from the menu, then click on the Whiteboard to stamp. Shape: draws shapes such as lines, arrows and squares. Click the down arrow next to the button to select another shape or color. Click the Select and Type button, and then click one or multiple drawings that you want to move. A selection rectangle appears around the selected object(s). Pause on the presentation (monitor) icon, and then click Manage Presentable Content. Click the More menu and choose an option: Save As, Send to OneNote, or Rename.